What does it mean to be starstruck? 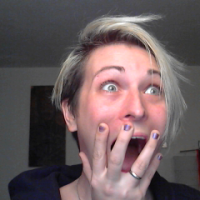 This should not be my face when I see someone famous. Does it mean to spaz out and act all weird? Act so nervously that the star calls the police on you? I personally had the experience of being a bit starstruck, several times. The most recent was going on a game show where there were several “stars”. There was Will Sasso, and Chris Hardwick. You might have guessed it. I was on @midnight. It was nice. I wasn’t all crazy, other than the fact that I was laughing my head off at pretty much everything that came out of their mouth. I think I was supposed to do that anyway. My first thought was like that old M&Ms commercial; “They do exist”! But that moment went away quickly as I was enjoying the show way too much to realize it. A while back, I did some extra work in Cleveland, link coming soon. I was in the movie American Splendor with Hope Davis and Paul Giamatti. A quaint little film about the lovable American cartoonist, Harvey Pekar. I had my 15 seconds of fame. It was definitely a different feeling to see myself in a movie. But the big starstruck moment was when I was standing right there in front of them. Two of the world’s best known actors, even if they’re only B-list, and there I was, 3 feet away from both of them. It was another M&Ms moment of “They do exist”. While standing there for 8 hours, trying to shoot one scene that lasted maybe 5 minutes on the screen, I didn’t want to say anything to them. Who knows? They might get freaked out and replace me. After all, they did pick me out of the crowd to “steal the luggage” from Mr. Giamatti as he calls me a yuppie. Being called a yuppie was the best thing that happened to me that day. Had it been anyone “lesser”, they probably would have seen the other side of my slight bipolar self. And as they were taken a bit by surprise from what I could see, they both looked my way, and Mr. Giamatti just laughed a bit, and said, “Yeah, we’re fine, thanks”. As if nothing ever happened, we both looked in our directions, and continued shooting the scene for the next two hours. It’s what’s to be expected when you’re producing a professional film with professional actors. You can read all about that in my other post [here] where I describe what it’s like to work on a professional movie set. “Warrior” with Nick Nolte, Tom Hardy and Joel Edgerton was another film that took forever to shoot. It was one of the fight scenes where they needed a lot of extras in the background. This one was shot in Pennsylvania. Good thing I lived in Ohio. Drove all the way out there with 3 friends of mine. One of them was Dontrell Callahan, and he ended up being pulled aside as one of the body guards. This was when he got his 15 seconds of fame. The thing took 2 days to shoot. Unfortunately, after 16 hours of standing up (for which we got paid), the second day seemed like it was not going to happen. So, we drove back home that night. Crazy times. It was definitely an awesome road trip. I wasn’t too close to the stars then, but my friend, Dontrell, got close enough to let us know later that Nick Nolte is a crazy dude. Was he starstruck? Maybe, a little. This was early on in Tom Hardy’s career, so maybe not as starstruck as he would be now, but still, Nick Notle? Nice. I think when it comes down to it, you will have that moment of deer stuck in headlights, because you’ve seen these people through an entertainment medium, never thinking that you’d have a chance to meet them. And then, here they are. In front of you. Right next to you. What do you say? How do you act? You feel like you’re going to do something stupid and mess up. It’s like a first date, or first interview and you have to impress. I know it’s not, but it sure feels like it. The energy that these guys carry with them on the screen and off, triggers some sort of emotion for anyone else understanding that. 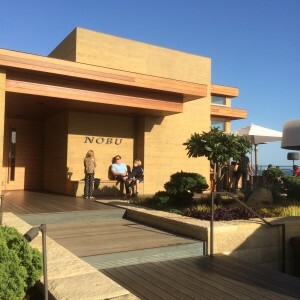 Nobu in Malibu. Expensive and delicious. You get for what you pay. In the end, they are just people, like you, and me, but it does feel pretty darn cool to experience such closeness to such talented people. I suppose that if you want to experience it with a higher frequency, move to LA and walk around the areas where stars usually hang around, like the Malibu Country Mart in Malibu, or eat at the Nobu restaurant in Malibu, or… you get the picture. 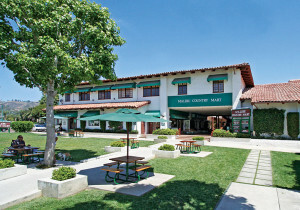 Malibu Country Mart with play park next to it. Where the stars shop. Another way to do it is by working close to them, I suppose. Being an extra and doing your part may land you in front of the camera as the waiter who took Tom Cruise’s order, or served Tom Hanks a cocktail in a bar on a set. So, sign up with Acting Showcase, create a profile, record some videos, and start sending them to producers all around the Los Angeles area for the best results. And, although Acting Showcase does provide that level of convenience to be seen via a live stream, nothing beats moving out to Hollywood. This entry was posted in Follies and tagged Hollywood. Bookmark the permalink.